Mayor Libby Schaaf’s administration and the Oakland Police Department are facing questions about whether they have a serious plan to end racial profiling by police of African-American residents, who make up the overwhelming majority of local residents stopped by OPD for no reason at all. The issue came up sharply at the City Council’s Public Safety Committee meeting last week when Deputy Police Chief LeRonne Armstrong—speaking for OPD—addressed the public’s concerns about the persistence of the high percentage of Africans who are racially profiled by the police. “This comment is offensive and untrue—and OPD leadership and (the) Oakland administration should formally retract this claim. Black people are being pulled over, searched and even arrested, when there is no crime and no cause for suspicion,” said Kaplan. “I think some people took the comment out of context. I apologize that the community has had to endure a comment that was taken in that way,” he said, pointing out that he is from the community and has had to experience unfair policing practices while growing up. 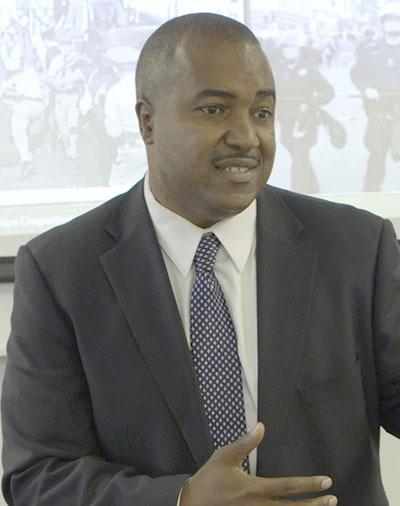 “We are not satisfied with the disparity numbers,” he said, adding that the department is holding more training for officers on diversity and around procedural justice. He said people are stopped for something they do, not because of their race. It is important for officers to explain to people the reason they were stopped, so they will know that “it was not racial but some behavior that occurred,” which caused the stop, he said. Mayor Schaaf did not respond to the Oakland Post’s questions. However, her office said she “addressed the issue directly at a Public Safety Town Hall… last Thurday.” The event had not yet been posted by OPD by the Post’s deadline. In an interview with the Post, Councilmember Kaplan raised concerns about the Schaaf administration’s reliance on the work of Stanford consultant Jennifer Eberhardt to end racial profiling by OPD. The trends indicate that fewer people are being stopped by the police, but African Americans are still stopped the most. Police non-traffic stops have fallen between December 2016 and November 2017 from 14,259 to 11,219, a 21 percent decrease. “Very little progress has been made as the share of Africans (in non-traffic) stops (has increased) slightly from 66 percent to 68 percent” of total stops, according to a PowerPoint presentation presented to OPD in February 2018 by the Stanford Technical Assistance Team. In the six months between June-November 2017, 5,259 African Americans were stopped by police—1,161 less than the previous six months. The City Council voted this week to extend Eberhardt’s contract over the objections of the Public Safety Committee, which wanted to look into what the city is going to do to end racial profiling before approving the $500,000, two-year agreement. At last week’s Public Safety Committee meeting, Couincilmembers Desley Brooks and Noel Gallo questioned approving a contract without a full discussion. “People who appear to have done nothing (illegal) have been stopped by police because of their race. That is not acceptable. And the mayor should not think that it’s acceptable,” said Councilmember Brooks. “Why doesn’t the mayor want to address the issue? Asked Brooks. “She said she is concerned, and this is important work, but she isn’t interested” in discussing the substantive issues. Mayor Schaaf released a statement to the media late Wednesday afternoon thanking the City Council for renewing the consultant’s contract. “Dr. Eberhardt’s intensive and transparent research will continue to advance policies that change the impact of policing communities of color,” she said.